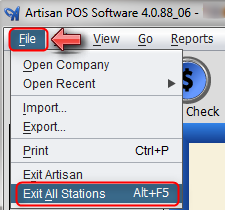 • Select File, “Exit Artisan”, from the Main Menu, by confirming Yes to close it. 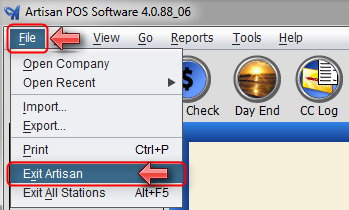 • Close the Artisan window by clicking on the Red Circled X in the upper right corner, by confirming Yes to close it. • Click the Square X on the top right corner to close out of Artisan, by confirming Yes to close it. Artisan allows forcing all stations out if they are IDLE, meaning Artisan is open on other stations but is not being used. Use this carefully as users may be doing some work on other stations and being IDLE for a moment will close Artisan losing all work. Only use if necessary and when nobody is using Artisan at all. • To close out of all Stations at once, click File Exit All Stations or Alt + F5, by confirming Yes to force close all Stations.